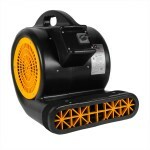 The Air Foxx AM400A carpet blower fan is our strongest air mover in the snail style carpet dryers category. The 1 HP motor moves up to 4000 CFM of air. That is a volume of air which is unheard of in this industry. This carpet blower fan dries damp areas in record times. Great for contract cleaners! This Air Foxx model is the big brother of our high volume air mover, which is slightly more economical, but still moves 3450 CFM on its highest setting. 1 HP motor moves 4000 CFM of air, making it the most powerful carpet drying fan on the market. 3 speeds allows you to the use the fan at its fullest potential depending on your needs. Plastic safety guard inlets extend motor life by keeping debris out. Rotationally molded body resists rusting, ensuring longevity. 3 positions (0°, 45°, & 90°), allow for drying in multiple positions. 11amps is not a 1hp motor and compared to the 15amp 1hp fan i already have that weighs 8 pounds more, i'd say this is a 3/4hp unit. but even though they call it 1hp, it's priced like a 3/4 and works great as my backup or secondary fan. only had a week so can say about how it will be long term, but happy with it for the price. This is a review for the Air Foxx 4000 CFM Carpet Blower & Fan.